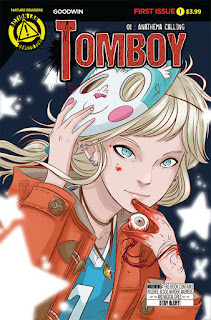 The Fellowship was fortunate enough to obtain a copy of TOMBOY #1 from Action Lab Comics. Mia Goodwin writes, draws and colors. Addison’s life is pretty good. She’s got a dad and a grandpa who love her, and great friends, and an addiction to the happiest kids’ TV show of all time. And it’s her sixteenth birthday to boot. It begins when her bestie doesn’t show up for school, and she learns by accident that he’s been murdered. When things get weird is when she stumbles across the thugs who killed him. Two things stand out in this first issue. One is just how sweet a kid Addison is. She’s just a normal girl, texting her friends and singing the “Princess Cheery Cherry” theme song with her family. So when things go wrong, the impact is that much greater. And the second thing is how much depth there is to what’s going on. There are tons of details dropped (which I won’t spoil) which hint at an impressively deep story. And the art transitions from anime-like cheerfulness to bloody horror at the drop of a – well, no spoilers. And beyond all of that, the character development is really nicely done, which helps to make this a very well-rounded book. The Action Lab gang has another winner here. TOMBOY #1 is available now at your FLCS or at actionlabcomics.com.